The mountaineer alimentation must be appropiate for the activity they’re undertaking because, amongst other reasons, when climbing altitudes of over 4,200 mts above sea level one can can lose up to 15% of body weight. The most frequent cause is loss of appetite, a consequence of exposure to very high or extreme altitudes. As means of comparison, let’s take into account that a very sedentary person needs from 1,800 to 2,100 calories a day to live, while someone more active needs between 2,700 to 3,000 calories a day, depending on their activities. Meanwhile, and this is the point that concerns us, a mountaineer’s system can consume from 5,000 to 6,000 calories a day, and even up to 8,000, on a very demanding day, for instance, when climbing to the summit. To give a better idea, let’s say that a climber that weighs about 70 to 80 kilograms can consume between 700 and 1,000 calories per hour on a particularly demanding day. 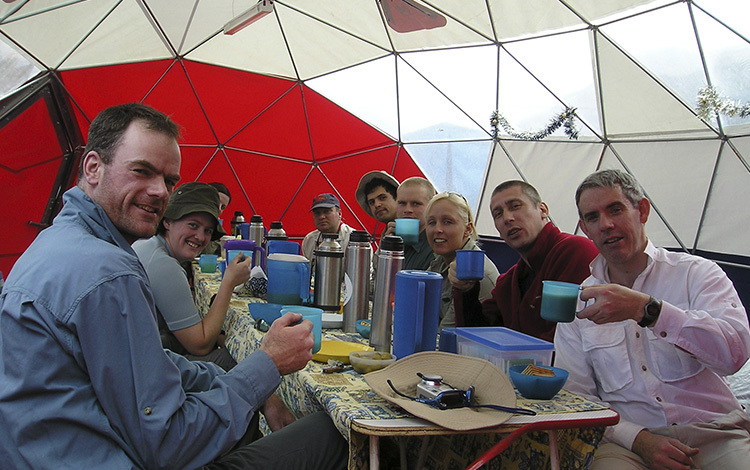 In the face of these needs and considering the importance of a good diet, it’s essential to be aware that the preparations and provisions one decides to take are of utmost importance, knowing how difficult it is to maintain a healthy alimentation during this activity, especially in high altitude camping sites. Here one must cook several times a day, preparing a big breakfast and dinner, but resorting to rapid digesting energy foods for the rest of the day. To optimize our energy reserves (found in our food), it’s important to plan ahead, taking into account the amount of time our expedition will take, and coming up with a well-balanced diet rich in energetic nutrients (glucose and lipid fats) for each day. We must make sure our food is easy to prepare and digest and most importantly, should require a small amount of oxygen and energy while digesting. For this, it’s important to keep in mind the composition of the food. Carbohydrates, also called sugar, are the nutrients that are absorbed quickly and convert into energy easily. The carbohydrate reserves are burned up two or three hours after starting physical exercise, which is why they must be consumed constantly, to replace the amount lost and to avoid fatigue. Glucose accounts for 8.3 and 14.5 g/kg of a person’s body weight, and the type that is absorbed quickest is found in fruit and honey. Amongst the main foods are wholemeal cereals, potatoes, vegetables, pasta, bread, biscuits and muesli bars. There are products such as Power Bars or Power Gel that have the advantage of a much higher absorption rate than conventional ones. The amount of carbohydrates to be consumed should be around 80 per cent, especially in the high mountains. Fats provide double the amount of energy than carbohydrates do, and make up an important supply for the body, but take longer to digest than carbohydrates. It’s recommendable to add fats to our diet in the mountains, but in normal amounts, because in excess they could lead to an increase of adipose tissue and fat levels in our organism. Foods rich in fat are, amongst others, oils, margarine, butter, nuts, almonds, olives, peanuts, bacon, ham, sardines, meat in general, milk, eggs, cheese, sausages, and cold meat. Proteins For mountain sports that demand high resilience it’s recommended to consume a smaller amount of proteins. Their main purpose is to repair and regenerate muscle tissue. Amongst foods rich in proteins are cheeses, nuts, almonds, ham, meat, milk, eggs and canned fish. Vitamins are crucial for regulating our metabolism, especially vitamin B, that helps transform energy; vitamin E protects the skin, that’s constantly being exposed particularly our hands and feet; vitamin D, helps sight and protect against ultraviolet rays, and vitamin A, regulates our hydro-sodic levels, lost mainly through perspiration. A balanced diet is usually enough. However, for very demanding expeditions it’s recommendable to take multivitamin supplements. 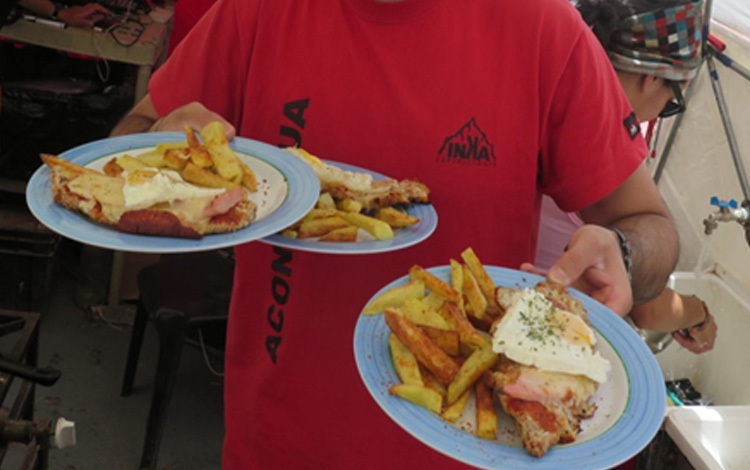 At Inka Expediciones we know that a good meal helps for a better acclimatization and increases the chances to reach the summit and that purchasing food, preparing meals and the packaging and transport of the food consumes a lot of energy. We have complete kitchen set up with professional chefs in our camps that personally take care for all the meals to be nutritional and high in energy for your expedition. We also consider those people who have special dietary requirements, like vegetarians or celiac. As we have our own mule transport we can guarantee fresh meals because we provide daily bread, meat, eggs, fruit and vegetables. We guarantee excellent meal service. We know that a comfortable ambiance also favors a good rest, so all of our meals at base camps are served in dining domes with tables and chairs, dishes, electric lights and wooden floors. 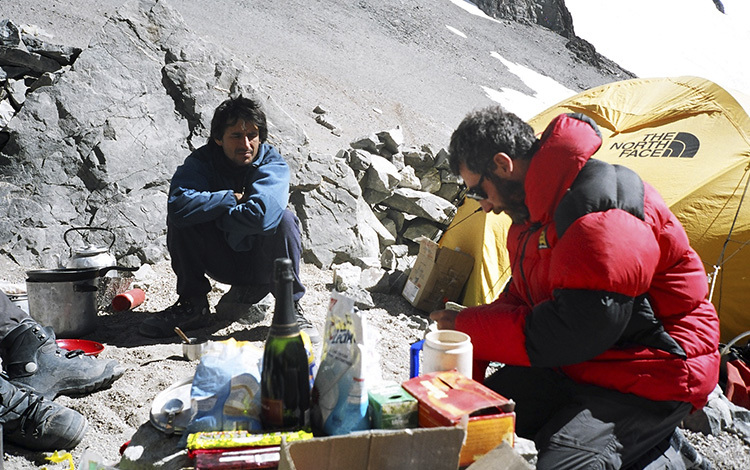 Besides, you will avoid the extra weight needed to transport food and cookware and also you will no need to cook, so you can take time to relax on the way to summit..
At high altitude camps, the guides prepare different meals and melt away snow for water and porters carry all the utensils for cooking. All you have to do is focus on the summit and save energy.